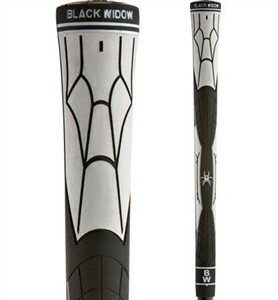 I'm not sure what a black widow spider and a golf grip have in common. I guess this metaphor is in reference to the grabbing abilities of a tacky spider web instead of the better-known traits of this cannibalistic insect. Or maybe it's just that Black Widow's cleats were so successful, they decided to stick to the theme. The textured grip uses a high-tech dual compound material to give the grip both a firm and soft feel. The idea is to put the firmness where you need it and the softness where you need it. Where do I need it you ask? Well, you may have never noticed where the club sits in your hand. (I am here to educate you.) The back of the grip is mostly held in your fingers whereas the top of the grip fits more in your palm. So if you were going make the grip with a progressive feel, where would you put the firm tacky side? If you said the back of the grip – you get a star. Usually if the club slips, its because the back of the club where your fingers hold on gets loose. These black windows are very tacky in your fingers, but the top is softer in your palms where the club fits secure regardless. This is what Black Widow calls their "Web Traction Technology." This is a firm, tacky section on the back of the grip for better control. This is combined with a softer section to give this grip an extremely satisfying feel and an exceptional performance. Good for Black Widow for coming up with this cutting edge design. I have a feeling that we will see a similar design “borrowed” from some of the bigger grip companies like Wynn and Golf Pride. However, I'm not a big fan of the graphics. This is one of the ugliest grips I’ve ever seen. And golfers are not snow skiers. (Remember the old Spider designs of the ski suits?) I don’t think too many golfers are going to be cool with their clubs looking like a Halloween costume or an accessory to a super hero outfit. Although that gives me an ideafor a new comicbook series... How about Spider-Golfer-man? No? Okay, well if you can get past the graphics, you will appreciate the exceptional feel of these new progressive grips. If you’re not ready to make the move, I suggest you check out the DD2 set from Golf Pride. Those aren't necessarily better, but they're more well-known and less "art nouveau". The black widow spider is in reference to softspikes longtime name recognition with black widow golf cleats.